'High Five' Ian Hutchinson 2010 TT by Billy 40x30cm(16x12"approx) Signed by Billy. 'High Five' is a celebratory drawing of Ian Hutchinson's record five wins at the Isle of Man TT races in 2010. 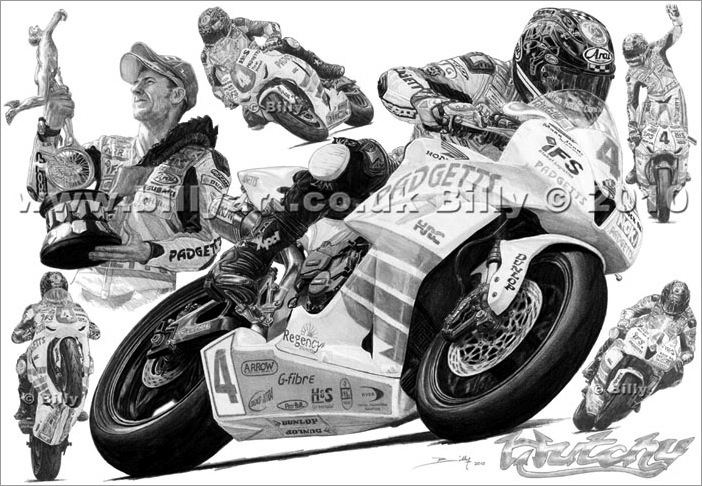 This Limited Edition print of Ian Hutchinson riding the Padgetts' Hondas at the 2010 TT is an edition of 150 signed and numbered by Billy. Taken from Billy the artist's A3 pencil drawing the print of Ian Hutchinson is 30x40cm in size(Designed to fit in a standard 40x30cm photo frame, approx 16x12 inches) £25 each with free post and packing. Ian Hutchinson won the IFS 'International Road Racer of the Year' Award at the January 2011 Irish Racer Awards. The award was given for Ian Hutchinson's ten international road race victories and his phenomenal five victories in one week in 2010 at the Isle of Man TT races. Ian Hutchinson Holding one of the TT trophies from his world record haul of Five wins in a week at the 2010 Isle of Man TT Races. A close up of the main image showing Billy's amazing attention to detail of Ian Hutchinson's special Isle of Man emblazoned Arai Helmet for the 2010 TT Races. Detail view of the engine and arrow exhaust of one of the Padgetts' Hondas on Billy's drawing that Ian Hutchinson piloted to victory at the 2010 TT races. The four extra detail side drawings by Billy to make the 'High Five' total. Ian Hutchinson's five TT victories from the 2010 Isle of Man TT races represented by five separate images by Billy along with the 'Hutchy' logo from the fairing screen on Ian Hutchinson's Padgetts Honda bikes. And finally a word form our sponsors.... Ian Hutchinsons' Padgetts Honda's sponsors for the 2010 victories included Renthal, Regency Travel, Arrow Exhausts, Signs-Extra, G-Fibre, Probolt, H & S Construction ltd, STM, OVER and Dunlop tyres captured here on the side and bottom of the fairing and rear swing arm by Billy. 'High Five' by Billy is a unique Ian Hutchinson fan collectors print that would make a great motorcycle gift. This print has free UK post but I use 'Airsure' or 'International Signed For' for international orders so chose UK or international below to purchase the Ian Hutchinson fine art print. If an international buyer wishes to purchase more than one print then please contact Billy with your requirements and one invoice with one International shipping fee will be sent to you.